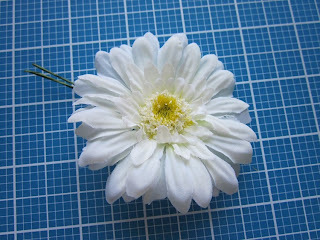 "Remove plastic backing and fuzzy center of a silk flower. 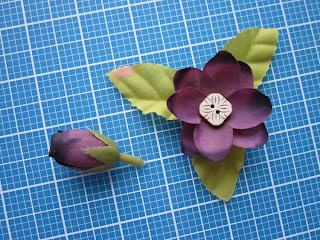 Glue the remaining layers of petals together. Create a new center with one large and seven small flat-back faceted gems." It reminded me of a bunch of sunflowers that I had in a box and didn’t know what to do with. They were much too thick to use on a card. So I grabbed one and started ripping it apart. (Nothing to lose, right?) By following these directions, I now have a flower I can use on a card – and will! 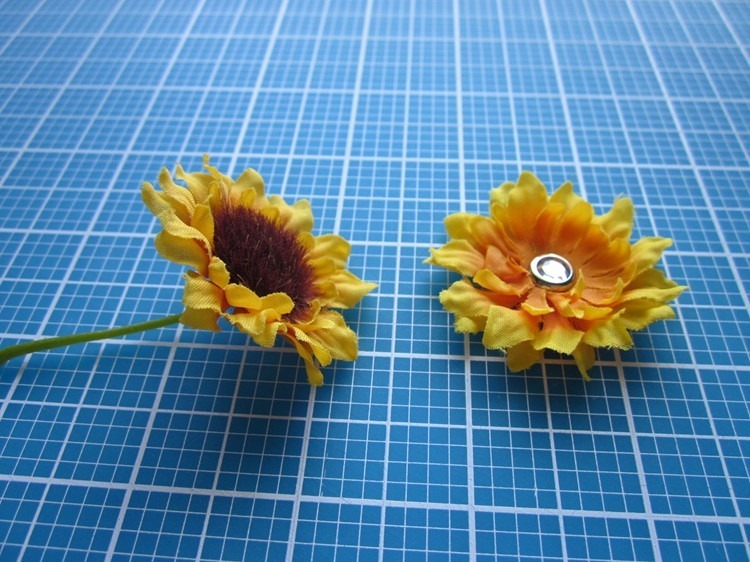 Here are the two flowers – sort of a before and after shot. I used a large-gem brad rather than gluing the parts together and adding the gems on top. For this small of a flower, that worked out just fine. I figure one could get creative with the centers, using buttons, brads, gems, other flowers … whatever. With this success, I decided it was time to use the same technique on a larger flower. I had purchased some large white flowers quite a while ago. I actually used one on a card, but eventually realized that it was just too thick and would not be practical to put through the mail. So I found one of those and started tearing it apart. I found more plastic pieces inside the flower to help it “puff up”, so to speak. I threw all of that away and made a usable flower. Here’s what the flower looks like straight out of the bag. As you can see, it is nearly three inches in diameter. 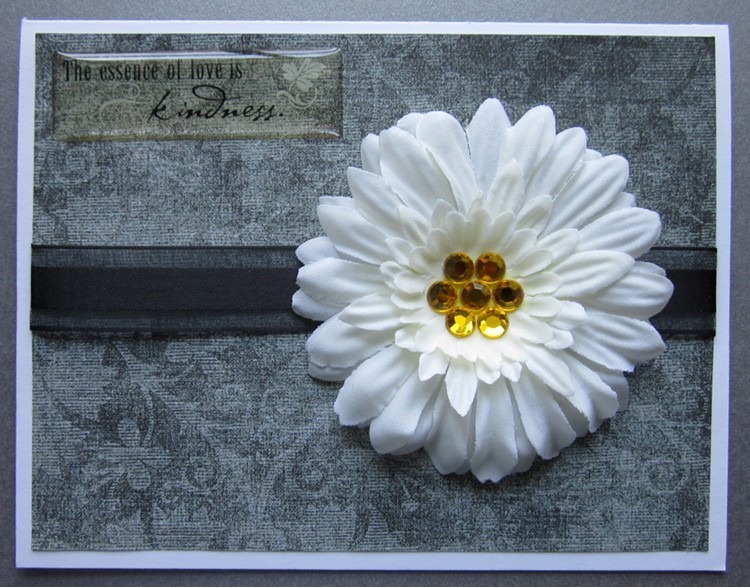 Here’s the card I made using the flower after it got it’s make-over. It’s still “puffy”, but once in an envelope it will flatten out so that it can easily go through the mail. I went back to my flower box to see if there was another type of flower deserving of a make-over. I found some rose buds that I started to play with. And they worked out fairly well, too. Here’s the before and after picture. One thing I really love about this process is the way the flowers still want to stand up/out. Their dimension is awesome, yet they will behave in an envelope going through the postal system. How cool is that! So now I can find ways to utilize the flowers that weren’t really an option for cards before. And I also know that I can pick up “fat” flowers or flower stems if I like them and be able to rework them into something useable on my cards. I’ll be watching those silk flower sales a little more closely in the future. Thanks again to Donna for offering today's tutorial. Be sure and go visit her blog! If anyone else would like to suggest or volunteer to offer a tutorial, please email me at kate@operationwritehome.org. Also remember you can find a list of all previous tutorials at the Cardmaking Resources page of the OWH website. Thanks for this tut--I'll be trying it. Opens up a lot of options for all those flowers you see at garage sales too. Thanks for the great tutorial! I love silk flowers and have an entire tote full of them! Thanks for sharing this tutorial. What great ideas to use those flowers. Wonderful tutorial! I'll definitely be using this one. I have tons of old silk flowers around -- I used to make flower fairies for the granddaughters and their friends but I think they're beyond those now. Nice to know tht the stash of flowers don't need to go to waste! Thanks so much. Great tips on using silk flowers! This wou;d probably be a lot less expensive then the ones you normally find in the scrapbook aisle too. Great tutorial, Donna! Hmmm... will have to check the stash. Very nice cards that you created with the "de-lumpified" flowers. Thank you so much Donna for this terrific makeover idea. You have just made my day. 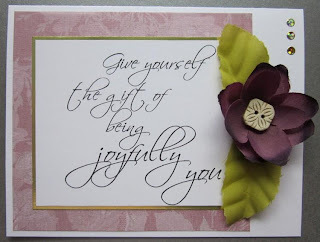 I'm heading to my box of old flower right now to find a flower to use on a card I started to make last night. I'm also heading over to your blog now. Thanks again. What a great idea! Being the only girl for two generations of my family, I can't resist buying all those cute flowers. Now I can actually use some! Wonderful tutorial, I have boxes and then some! What a great tutorial! I never bought silk flowers because they were way too bulky, but I just might now! And I'm sure they are a much better buy than little envelopes of the paper flowers! Great cards. I just layer them up and stick a brad in the center to hold the whole thing together. I've got a bunch of dismantled silk flowers waiting to be used... the diamante center you made is cute. Great tip, I just figured everyone already knew about it, LOL! I have been using silk flowers for years. Especially the $1.00 kind! I usually get 10 to 15 flowers out of one bunch. Can't beat those prices! Thanks for refreshing our minds!